With the majority of the product announcements out of the way, Day Two of Adobe Summit in Las Vegas was able to let its hair down and talk about inspiration, transformative leadership and designing a better future. Without doubt the highlight of the morning plenary session was an interview between Adobe CMO Ann Lewnes and the force of good nature that is the ineffable Reese Witherspoon. It’s not hard to see why Witherspoon has been such a success. Her charm and wit is contagious and her easy smile would melt the heart of even the most severe cynic. However she’s far more than just a charming actor. She has a steely business mind has seen her start several businesses and even change the stories we are telling. Witherspoon has set about rewriting the script for Hollywood through her production company Hello Sunshine, which she describes as a storytelling platform by and for women. When Ann Lewnes asked Witherspoon why she created Hello Sunshine, she said she was reading a script which was the worst script in the world. “It was misogynistic and everything a female character said was just in service to a male character . . . So I got onto my agent and said I’m not doing this movie. She said every actress in Hollywood wants this part. I said, if every actress in Hollywood wants this pat, I’ve got to do something about this. This is not good enough for me and it’s not good enough for my colleagues,” she said. Here’s a quick video about it. Witherspoon went on to say that the most the crucial change in the industry in recent times was the emergence of streaming technology and the data that was giving to decision makers. And her advice to all parents was if your children don’t let them follow you, take away their phones. “It’s not a democracy in my house,” she quipped. If you want to lear to be a little bit more like Reese, don’t forget to buy your tickets to B&T’s Changing the Ratio event. If you ever wondered what $50 million worth of CEO leadership looks like, this picture is it. What’s telling about the two gentleman above, is that they both hale from India and they’re both engineers. Microsoft of course is a much larger company, having been the world’s largest company at the turn of the millennium, it still regularly hangs around the top three to five companies in the world, and has a market cap of around $780 billion. Adobe, on the other hand, has a market cap of $128 billion. Among the many things they discussed, Nadella discussed how the Adaptive Controller project was the result of a hackathon and allowing people to pursue projects they are passionate about. Of course, Microsoft also used the below clip as their super bowl ad. You can watch all of the presentations from Summit here. Here’s the day two announcements. 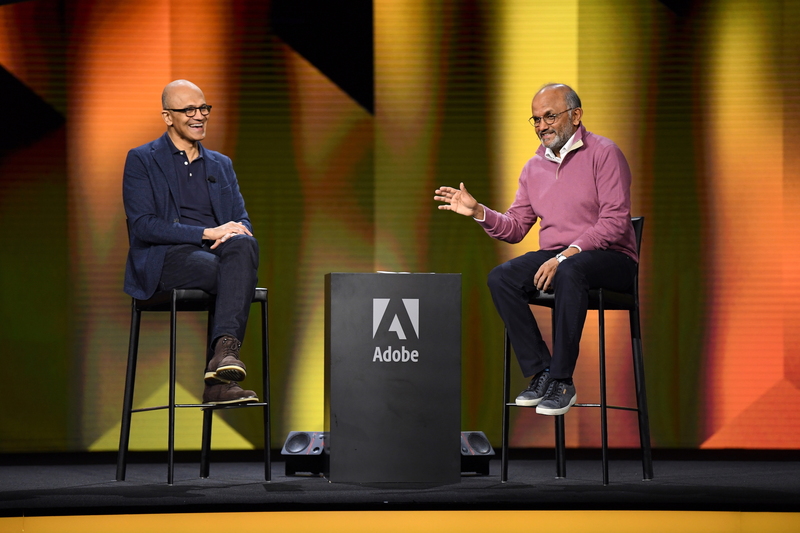 Today at Adobe Summit, the industry’s leading customer experience conference, Adobe CEO Shantanu Narayen and Microsoft CEO Satya Nadella revealed additional details about the Open Data Initiative (ODI). As originally announced last September, Adobe, Microsoft and SAP have embarked on a new approach to business data that will help companies transform their customer experiences through real-time insights delivered from the cloud. To improve that process, the three companies plan to deliver in the coming months a new approach for publishing, enriching and ingesting initial data feeds from Adobe Experience Platform, activated through Adobe Experience Cloud, Microsoft Dynamics 365 and Office 365 and SAP C/4HANA, into a customer’s data lake. This will enable a new level of AI and machine learning enrichment to garner new insights and better serve customers. Unilever, a mutual customer and one of the early global brands to express support and excitement about the ODI, today announced their intention to simplify a previously complex business outcome based on these data connections. At Adobe Summit, Unilever is demonstrating how they plan to bring together disparate customer, product and resource data and use AI-driven insights to help reduce their plastic packaging and encourage consumer recycling. By eliminating the silos of data, Unilever will be able to tie inventory and plastics data into Adobe data to enhance customer experiences and encourage participation. To accelerate development of the initiative, Adobe, Microsoft and SAP also announced today plans to convene a Partner Advisory Council consisting of over a dozen companies including Accenture, Amadeus, Capgemini, Change Healthcare, Cognizant, EY, Finastra, Genesys, Hootsuite, InMobi, Sprinklr and WPP. These organisations span myriad industries and customer segments and believe there is significant opportunity in the ODI for them to drive net new value to their customers. Today at Adobe Summit more than 16,000 attendees will get an up-close look at the latest technology being developed in Adobe’s R&D labs, including AI, mixed reality and voice. Hosted by actress Mindy Kaling, Adobe’s popular “Summit Sneaks” offers an exciting and entertaining look into the future of Adobe innovation. In its eighth year, Sneaks gives Adobe engineers, researchers, product managers and UX designers the opportunity to submit proposals for a chance to present their work at Adobe Summit. Audience favourites have the potential to become product offerings, like Smart Layout in Adobe Experience Manager and Attribution IQ in Adobe Analytics. Accelerating AR Experiences: Imagine an airport where a customer has an hour to wait for a connecting flight. The airline mobile app is equipped with an augmented reality (AR) feature, which shows “AR zones” on an interactive terminal map. The customer can walk up to a bookstore and see custom promotional offers as AR objects, which can then be instantly redeemed through a digital wallet. To help brands accelerate AR offerings, Adobe is showcasing how tight integrations across Adobe Experience Cloud can deliver the technology backend to quickly build and scale experiences in AR. It brings together 3D content and delivery, with commerce, analytics and personalisation capabilities. Future Gazing for Marketers: When decisions are made around customer experiences, they are traditionally driven by historical data. For instance, if a subscription service identifies a group of users who have unsubscribed, these people are targeted with content to re-engage. As in many cases, brands are often one step behind the customer. To address this, Adobe is presenting new technology that applies Adobe Sensei’s deep learning capabilities to predict future actions. By analysing past data and patterns around known user behaviours, the system will infer the actions that customers are most likely to take next. In the subscription service example, it will empower the brand to not only see users that are most likely to leave the service, it will also suggest a set of actions that has the best chance of changing their minds. Transforming Documents with AI and Voice: For any profession that deals with long-form documents such as vendor contracts and academic papers, the process of finding relevant details has largely remained a manual and time-consuming task. Adobe is unveiling a new project that will change the way consumers interact with documents, leveraging text recognition AI and voice control capabilities. Users would be able to talk to their documents and quickly surface relevant information. For instance, a marketing director reviewing an agency contract can ask “how is the price different from what we paid last year?” and instantly get the details. Finally, here’s a fun video of Day 1 highlights just for kicks.